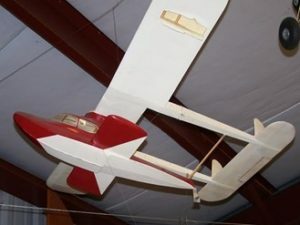 This model airplane appears to us at the Wings of History to be an original design by Walter Addems. Because we have the model it gives us an opportunity to share with you some history about this local aviator. Walter Addems was a pioneer aviator who built his first airplane in 1916 and his last one in the 1960’s, but only after he had barnstormed across the nation and flown the mail in the 1920’s, trained pilots in the 1930’s, and served as director of flight operations for United Airlines until the 1950’s. He died at the age of 98 at a hospital in Palo Alto. When Mr. Addems was in high school he built his first airplane a glider, from plans in the aviation magazine Aviation Week. At the time he lived in Oakland and had a friend tow him with a touring car in a pasture south of town. On that day he soared to perhaps fifteen feet above the ground for a short flight as it ended when he collided with a fence. But the flight had qualified him for membership in a very exclusive club: the Early Birds, 598 men and women who had flown solo, some in hot air balloons, before December 17, 1916! Over the next several years, he bought, built and flew just about every famous airplane of his era, among them the Curtiss JN-4 trainer, The World War I Jenny and a Thomas-Morse Scout. In 1920, he moved to Judd, Iowa, and honed his flying skills at the local airstrip and was soon off barnstorming, participating in air shows. He married a school teacher, Genevieve Mongeau in 1925 and they were married until her death 70 years later. With a wife to support, Mr. Addems gave up barnstorming and began flying the mail from Chicago to Milwaukee which was a forerunner of Northwestern Airlines. In 1927, he switched to the Chicago – Cleveland route of the fledgling National Air Transport and stayed on when it became the eastern wing of United Airlines in 1931. With the Postal Service offering a bonus for night deliveries, Addems became a pioneer in testing instrument flying equipment, becoming so proficient that the self-taught pilot was soon training other United pilots. As United’s most revered pilot, he became director of flight operations, flying and mapping each new route, testing each new airplane and developing many procedures that became industry standards. Although he was always a stickler for safety, Mr. Addems lost his desk job at the Denver headquarters when the airline suffered a series of crashes in the early 1950’s. Many of the airline’s pilots thought he had been unfairly treated, but Addems could hardly complain. As a result of the demotion he was returned to the skies, first flying between San Francisco and Tokyo on government contract runs and then becoming the chief pilot on United’s San Francisco-Hawaii route. After he reached the mandatory retirement age of 60 in January 1959, Addems, who had settled in Atherton, California, began to build a replica of the famous Nieuport flown by the Lafayette Escadrille in World War I. Over the next two decades, he performed at exhibitions and even had a stint as a movie pilot. At age 83 he made his last flight by flying his Nieuport to donate it to the San Diego Aerospace Museum. The Walter Addems seaplane model in the museum gives us the opportunity to view and to learn about the use of “sponsons” on aircraft. 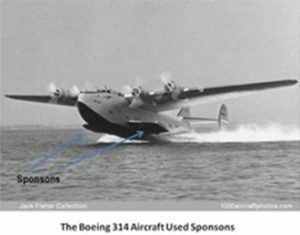 The sponsons on the Addems model are the short stubby wing-like structure that sticks out at the waterline of his seaplane. Sponsons are projections extending from the sides of aircraft to provide protection, stability, storage, mounting points and/or equipment housings for armament. –Extend a watercraft hull at or below the waterline to increase flotation and add lift when underway. –Serve as a mounting or enclosure for a gun projecting in part or whole beyond the airplane’s fuselage. –Take the form of a short wing on the fuselage of flying boats, providing hydrodynamic stability when traveling through the water during takeoff and landing, as pioneered by German aerospace designer and engineer Claude Dornier on the Zeppelin-Lindau Rs.IV during World War I. –Provide storage for fuel or housing for the landing gear on larger helicopters such as the Sikorsky S-92 and Bell 222.